Substitute all the values in above formula you will get the capacity of pit. 1 feet cube area(1′ length * 1′ width * 1′ height) will store upto 28 ltrs of water. On top of the rings two rocks will be placed with 6″ hole. 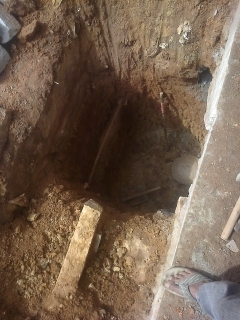 6″ pipe need to be fixed in hole. This provision is required to clean pit without removing rocks.